303/365 – “Night Walking” nr.30, a photo by Luca Rossini on Flickr. Thirtieth day of “Night Walking”. 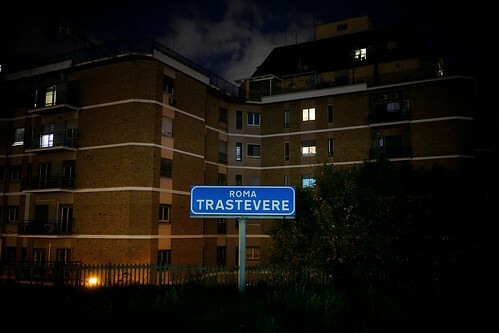 Trastevere, Rome, Where It Ends. I’m really glad I did the “Night Walking” theme. It gave me a reason to explore my new neighbourhood in a way I couldn’t when my dog Lucy was alive because she didn’t want to night walk too far from home. It also gave me a way to mourn Lucy’s death by understanding, and finally accepting, the emptiness and loneliness she left me. At home, between my work, my wife, and mostly my little daughter Agata, I was too busy to ever feel lonely or empty and that made me sad, like I couldn’t really feel Lucy’s loss. But once back at night walking among empty and dark streets, parkings, courtyards, and alleys I immediately, strongly, deeply felt the void. A void that made me warm and happy. That void is Lucy, I now know where it is, and how to feel it if I need. It’s what she left, together with tons of memories, and it will exist as long as I will exist. I can’t help but to compare this theme to your Momentary Suspended exhibition, because both of them consist of similar pictures, at least on the surface. Now speaking on Momentary Suspended, I have to admit that as much as I liked the pictures and mood behind them, I found your naming scheme a bit contrived. I felt as you didn’t trust pictures enough and wanted to help interpretation by naming them the way you did. Don’t get me wrong, your pictures are unique and I love them, but I felt naming scheme was underlining the mood a bit too much (it is already there!) and pushed me into direction that doesn’t necessarily concur with my interpretation. As a viewer I felt I have to accept something, like interpretation of the situation, before I look at the pictures. Kind of forced strangeness or something… Still, Momentary Suspended still continues to be my favorite from your works. Maybe it’s just because first impressions often defines one and becomes some sort of landmark where everything else is compared to. Now that you have sort of ‘come back to start’ with your Night Walking theme (although there are differences like people missing from pictures), I feel you have solved it much better by including your writings with them. Relying on societal themes and contemporary narration you create much more believable imagery of strangeness of our time. Shaping perspectives with the aid of sociology, history etc. can be used to expose what is felt normal very differently. Now I find myself looking your pictures of empty courtyards and alleys, and connect them with the uncertainty and strangeness of this time. What’s most important: I believe what you have to say. I can definitely imagine these pictures in some exhibition with the texts included. Just from the visual perspective my favorites pictures are 6, 9, 19, 22 and 27. Very good compositions regarding that you are effectively photographing empty spaces. I hoped that every picture would have had those nice narrations included, but I understand that it’s not something you can just get ‘from the shelf’ every day. Please do them afterwards and make exhibition of this theme. Why did I like this theme? I think you’ve developed a context for your pictures here better than in your Momentary Suspended exhibition. In short, it shows your development.